Y’all know I love my “bowl” meals! Everything you need in one easy to eat (and transport) bowl, no need to worry about what side dishes go with what. Plus, they’re easy for you to customize if you have special dietary needs. 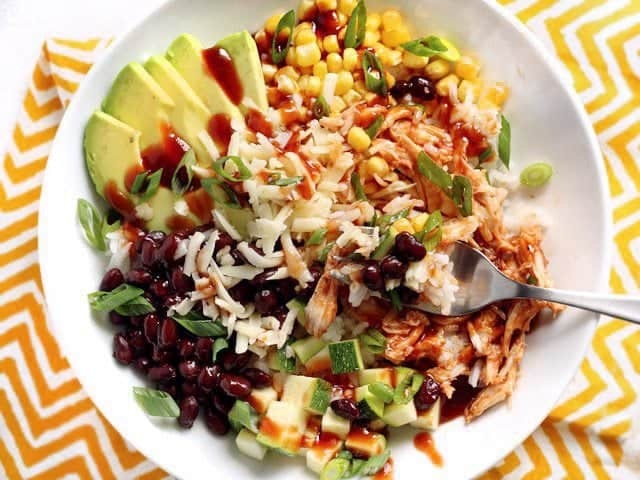 Today’s BBQ Chicken Burrito Bowls is even more awesome because it’s actually quite delicious either hot or cold. So, all of you who don’t have access to a microwave at work, this one is for you! I bought a rotisserie chicken this week and am using one of the breasts for all four bowls. 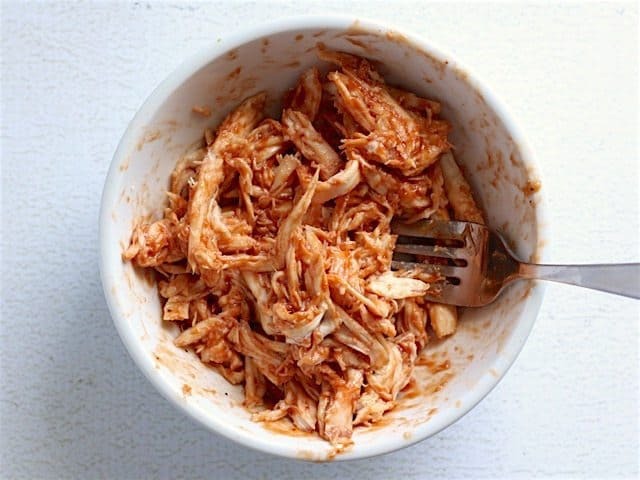 If you don’t have a rotisserie chicken, you can cook up a boneless, skinless breast quickly in something like a George Foreman Grill, chop it up, then mix it with the BBQ sauce as I did with mine. Not into chicken? No worries. I think roasted sweet potato cubes would make an awesome addition to this dish and a nice filling alternative to the chicken. Here are some other fun add-ins that go along with the BBQ theme if you don’t like one of the other ingredients I used: pineapple, diced red bell pepper, jalapeño, red onion, corn chips or tortilla strips. 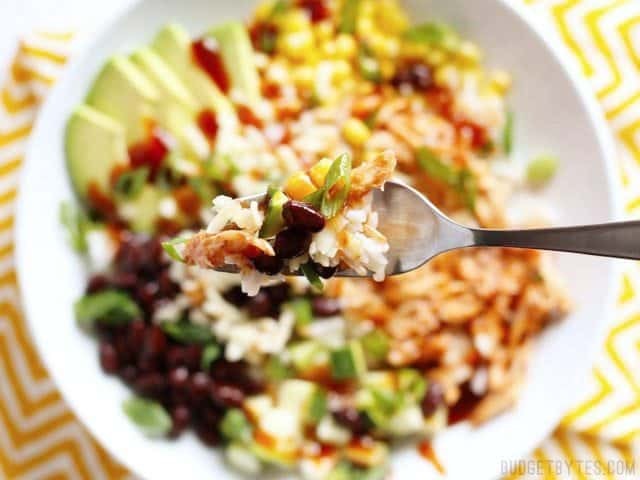 BBQ Chicken Burrito Bowls are an easy, customizable lunch option that is great both hot or cold! Vegetarian substitutions included. Chop or shred the chicken breast and mix with 2-3 tablespoons of BBQ sauce until the meat is well coated. Drain and rinse the black beans. 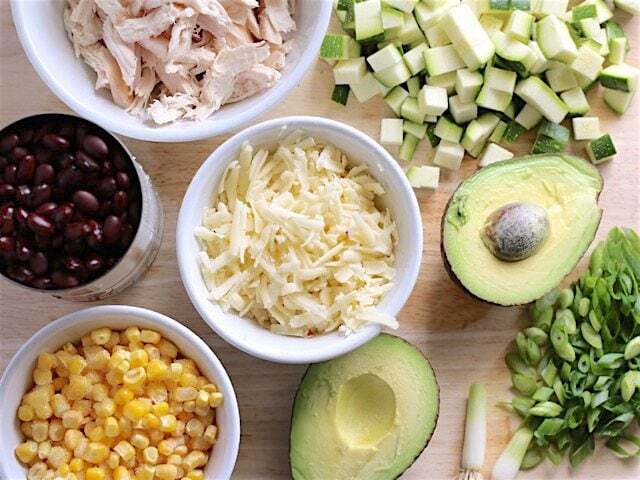 Cut the zucchini into small cubes (1/4-1/2"), shred the pepper jack, slice the green onions, and pit and slice the avocado. To build the bowls, place 1 cup cooked rice in the bottom of each bowl. 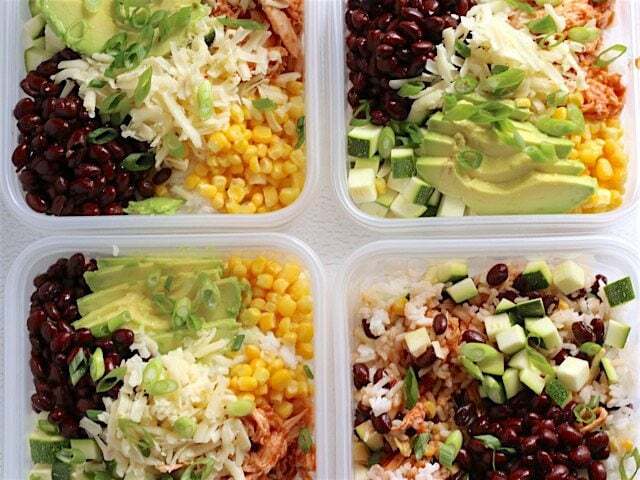 Divide the chicken, beans, corn, zucchini, shredded cheese, green onions, and avocado slices equally among all four bowls. Drizzle one more tablespoon of BBQ sauce over top and serve, or refrigerate until ready to eat. *I used a rotisserie chicken breast, which was approximately 1/4 of the whole chicken. 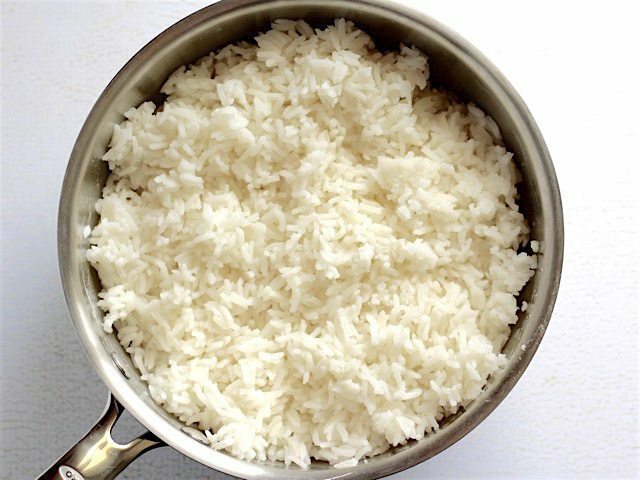 Prepare 4 cups of cooked rice, if you don’t already have it on hand (FYI extra rice freezes really well, so you can always have cooked rice on hand). Chop or shred the chicken breast. 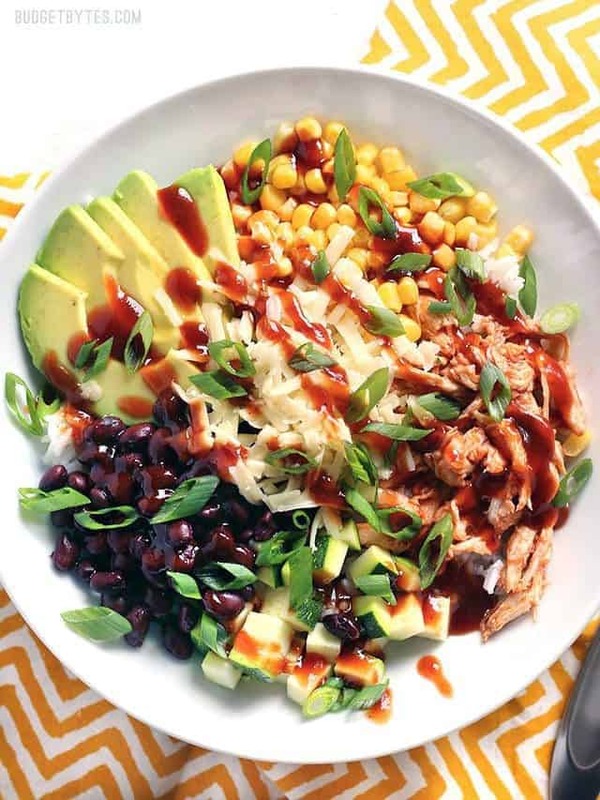 Rinse and drain the black beans, cut the zucchini into small cubes, slice the green onion, shred the pepper jack, and pit and slice the avocado. Add 2-3 Tbsp BBQ sauce to the chicken and stir until it’s well coated in sauce. Then just build your bowls! Place 1 cup of the cooked rice in the bottom of each bowl and then divide the remaining ingredients equally among each bowl. Drizzle about 1 Tbsp more BBQ sauce over top. (I didn’t say it, but ranch will also go really well with this bowl). Can I rate this 10 stars please? It was so delicious! Everything tasted so good together! I used fresh sweet corn and cooked my zucchini. Can’t wait to make this one again, perfect summer dinner! This one is a keeper! I made it vegan by using Butler’s Soy Curls and deleting the cheese. Although I wondered if the amounts of beans and vegetables listed would really stretch to make four bowls, they were exactly right. The bowls were equally good warm and freshly made and cold for lunches the next day. I’m planning to put this one in the rotation and make it a lot! Beth, you make magic happen. Is there another bean that can be substituted for the black bean? Thank you! Pinto beans would probably work well. This recipe was a lifesaver when I had quesadillas on the menu only to find out that I hadn’t bought half the ingredients needed for them, most importantly tortillas. I scrounged the freezer and fridge and came out with the bottom of a bag of frozen corn, a sweet potato, a zucchini, rotisserie chicken, cheddar cheese, leftover BBQ sauce, and some frozen brown rice. I roasted the sweet potato with chili powder and cooked the zucchini and corn in a skillet (raw zucchini would not fly around here). They were delicious! Bonus, I used up some odds and ends that we’re hanging around in the fridge and freezer. Thanks! Hey Beth! 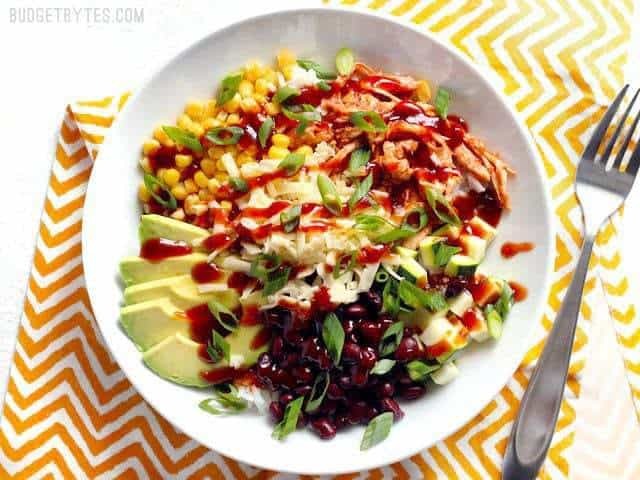 If I were to cook a raw boneless skinless chicken breast for this salad, what method of cooking would you recommend for the chicken? How well would this freeze? I’m guessing not well, but I’ve certainly been wrong about this before. Do you heat these up or just eat them cold normally? Holy smokes! Why didn’t I ever think of this recipe?! I guess that’s why we have you, Beth! I have loved everything I’ve tried from your blog and cookbook. I ate this for dinner last night and have 3 meals ready for lunches this week. Thank you so much for publishing recipes I know will taste delicious. I can’t say the same for other blogs with pretty pictures. :) PS–I tossed the Avocado in a little lemon juice and it stayed nice and green. I forgot to put in the zucchini and I substituted the green onions for fresh cilantro. It delicious and super healthy. Very pleased with this recipe. Ideal for a summer lunch. Thank you! This looks great! I have some left over pulled pork in the fridge, so I’m going to use that instead of chicken, and eat it over brown rice! I’m starting a new job where I need to take my lunch so these bowls are a godsend. I used to make the spicy tuna guac bowls, but this will be a nice change. Looking forward to enjoying them! Beth, I threw this over greens instead of rice and it was sooooo good. Another winner!